Figure 1. Event recorded with the CMS detector in 2012 at a proton-proton centre-of-mass energy of 8 TeV. The event shows characteristics expected from the decay of the SM Higgs boson to a pair of photons (dashed yellow lines and green towers). The event could also be due to known standard model background processes. Figure 2. 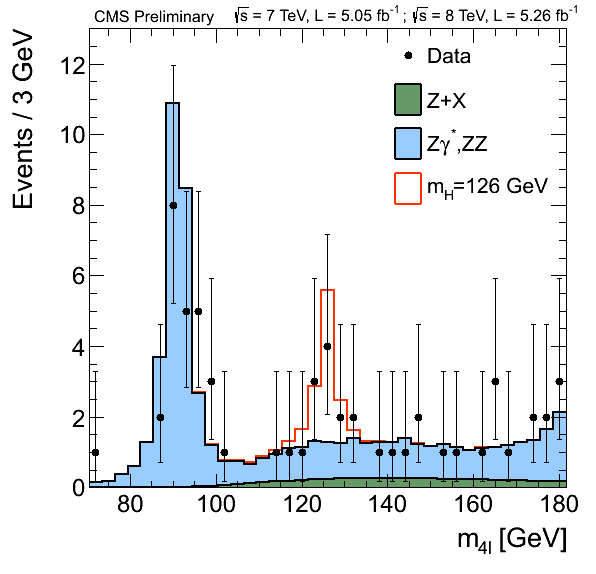 Event recorded with the CMS detector in 2012 at a proton-proton centre-of-mass energy of 8 TeV. The event shows characteristics expected from the decay of the SM Higgs boson to a pair of Z bosons, one of which subsequently decays to a pair of electrons (green lines and green towers) and the other Z decays to a pair of muons (red lines). The event could also be due to known standard model background processes. Figure 3. Di-photon (γγ) invariant mass distribution for the CMS data of 2011 and 2012 (black points with error bars). The data are weighted by the signal to background ratio for each sub-category of events. The solid red line shows the fit result for signal plus background; the dashed red line shows only the background. Figure 4. Distribution of the four-lepton reconstructed mass for the sum of the 4e, 4μ, and 2e2μ channels. Points represent the data, shaded histograms represent the background and un-shaded histogram the signal expectations. The distributions are presented as stacked histograms. The measurements are presented for the sum of the data collected at centre-of-mass energies of 7 TeV and 8 TeV. Figure 5. The observed probability (local p-value) that the background-only hypothesis would yield the same or more events as are seen in the CMS data, as a function of the SM Higgs boson mass for the five channels considered. The solid black line shows the combined local p-value for all channels. In a joint seminar today at CERN and the “ICHEP 2012” conference in Melbourne, researchers of the Compact Muon Solenoid (CMS) experiment at the Large Hadron Collider (LHC) presented their preliminary results on the search for the standard model (SM) Higgs boson in their data recorded up to June 2012. 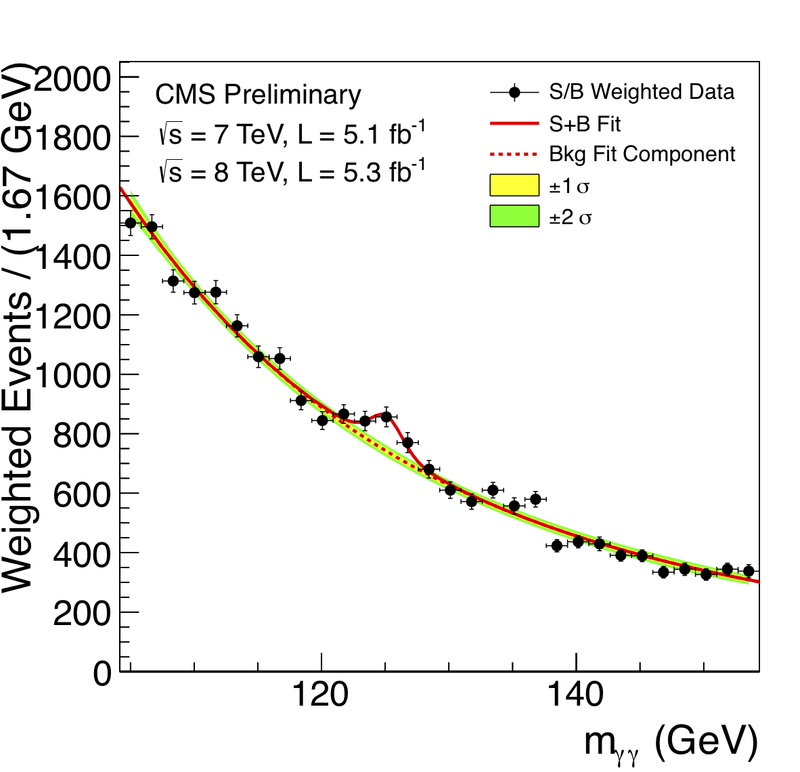 CMS observes an excess of events at a mass of approximately 125 GeV with a statistical significance of five standard deviations (5 sigma) above background expectations. The probability of the background alone fluctuating up by this amount or more is about one in three million. The evidence is strongest in the two final states with the best mass resolution: first the two-photon final state and second the final state with two pairs of charged leptons (electrons or muons). We interpret this to be due to the production of a previously unobserved particle with a mass of around 125 GeV. The CMS data also rule out the existence of the SM Higgs boson in the ranges 110–122.5 GeV and 127–600 GeV with 95% confidence level – lower masses were already excluded by CERN’s LEP collider at the same confidence level. Within the statistical and systematic uncertainties, results obtained in the various search channels are consistent with the expectations for the SM Higgs boson. However, more data are needed to establish whether this new particle has all the properties of the SM Higgs boson or whether some do not match, implying new physics beyond the standard model. The LHC continues to deliver new data at an impressive rate. By the end of 2012, CMS hopes to have more than triple its total current data sample. These data will enable CMS to elucidate further the nature of this newly observed particle. They will also allow CMS to extend the reach of their many other searches for new physics. CMS analysed the full data sample of proton-proton collisions collected in all of 2011 and in 2012, up until June 18. These data amount to up to 5.1 fb−1 of integrated luminosity, at a centre-of-mass energy of 7 TeV in 2011 and up to 5.3 fb−1 at 8 TeV in 2012. The standard model predicts that the Higgs boson lasts for only a very short time before it breaks up, or “decays”, into other well-known particles. 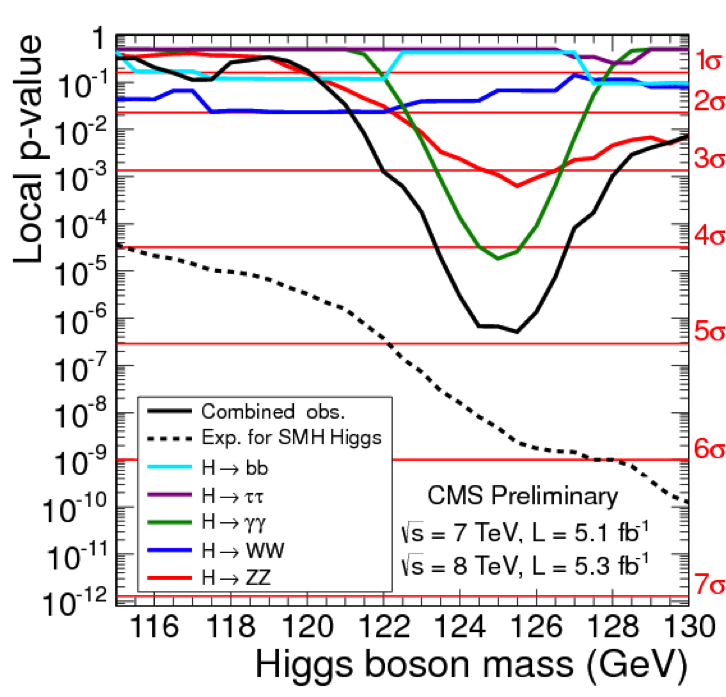 CMS studied five main Higgs boson decay channels. Three channels result in pairs of bosonic particles (γγ, ZZ or WW) and two channels result in pairs of fermionic particles (bb or ττ), where γ denotes a photon, Z and W denote the force carriers of the weak interaction, b denotes a bottom quark, and τ denotes a tau lepton. The γγ, ZZ and WW channels are equally sensitive in the search for a Higgs boson around 125 GeV and all are more sensitive than the bb and ττ channels. The γγ and ZZ channels are especially important as they both allow the mass of the new particle to be measured with precision. In the γγ channel the mass is determined from the energies and directions of two high-energy photons measured by the CMS crystal electromagnetic calorimeter (ECAL, Figure 1). In the ZZ channel the mass is determined from the decays of the two Zs to two pairs of electrons, or two pairs of muons, or a pair of electrons and a pair of muons (Figure 2). These are measured in the ECAL, inner tracking and muon detectors. The WW channel is more complex. Each W is identified through its decay to an electron and a neutrino or a muon and a neutrino. The neutrinos pass through the CMS detectors undetected, so the SM Higgs boson in the WW channel would manifest itself as a broad excess in the mass distribution, rather than a narrow peak. The bb channel has large backgrounds from standard model processes, so the analysis searches for events in which a Higgs boson is produced in association with a W or Z, which then decays to electron(s) or muon(s). The ττ channel is measured by observing τ decays to electrons, muons and hadrons. γγ channel: the γγ mass distribution is shown in Figure 3. There is an excess of events above background with a significance of 4.1 sigma, at a mass near 125 GeV. The observation of the two-photon final state implies that the new particle is a boson, not a fermion, and that it cannot be a “spin 1” particle. ZZ channel: Figure 4 shows the mass distribution for the four leptons (two pairs of electrons, or two pairs of muons, or the pair of electrons and the pair of muons). Accounting also for the decay angle characteristics, it yields an excess of 3.2 sigma above background at a mass near 125 GeV. WW channel: a broad excess in the mass distribution of 1.5 sigma is observed. bb and ττ channels: no excess is observed. The excess is seen in a range of final states involving photons, electrons, muons and hadrons. The preliminary results presented today will be refined, with the aim of submitting them for publication towards the end of the summer. The new particle observed at about 125 GeV is compatible, within the limited statistical accuracy, with being the SM Higgs boson. However, more data are required to measure its properties such as decay rates in the various channels (γγ, ZZ, WW, bb and ττ) and ultimately its spin and parity, and hence ascertain whether it is indeed the SM Higgs boson or the result of new physics beyond the standard model. The LHC continues to perform extremely well. By the end of 2012, CMS expects to more than triple its total data sample, and hence to probe further the nature of this new particle. If this particle is indeed the SM Higgs boson, its properties and implications for the standard model will be studied in detail. If it is not the SM Higgs boson, CMS will explore the nature of the new physics that it implies, which may include additional particles that are observable at the LHC. In either case, searches will also continue for other new particles or forces that can be observed in future runs of the LHC at higher beam energies and intensities.